Skydiving in Atlantic City, NJ: A breathtaking experience! Skydive Cross Keys is located about 45 miles west of Atlantic City, NJ. That's an easy 40-45 min drive. You can get a taxi or an Uber ride from Atlantic City to our location for about $90. 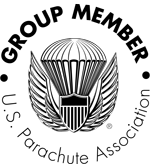 Divide that between a few friends and enjoy a relaxing day skydiving! Here are the step by step directions from Atlantic City, NJ to our skydiving center. Turn right onto Dahlia Ave and follow it to the very end to find our skydiving center! Our experienced pilots and modern turbine airplanes can take your whole group to 13,500' in about 8-10 minutes! The superior quality of our photo and video packages speaks for itself!